Secretary General of the Jamaica Teachers’ Association (JTA), Mr. Adolph Cameron (right), in discussion with Jamaica’s Honorary Consul to Los Angeles, Ms. Lorna Johnson, at the Jamaica Awareness Association of California (JAAC) 27th annual fund raising banquet at the Los Angeles airport Marriott on November 23. Others (from left) are: Diaspora Advisory Board member to the mid-west, Mr. Leo Gillins; JTA President, Dr. Mark Nicely, and President of the JAAC, Yasmin Facey. Prime Minister, the Most Hon. Portia Simpson Miller, says she is encouraged by Jamaicans in the Diaspora, who are dedicated to the progress of their homeland. She pointed out that the Jamaica Awareness Association of California (JAAC) has been a blessing to Jamaica, through its commitment and support. The Prime Minister lauded the organization for conducting its 14th Annual Medical and Education Mission to Jamaica. Prime Minister, the Most Hon. Portia Simpson Miller, says she is encouraged by Jamaicans in the Diaspora, who are dedicated to the progress of their homeland and actively participate in its development and the well-being of the less fortunate in the society. In her message, read at the Jamaica Awareness Association of California 27th Annual Fund-raising Banquet at the Los Angeles Airport Marriott Hotel on November 23, the Prime Minister said that Jamaican organizations in the diaspora have been making tremendous contributions in a number of areas, which have benefitted hundreds of Jamaicans. She pointed out that the Jamaica Awareness Association of California (JAAC) has been a blessing to Jamaica, through its commitment and support, both at the individual and national levels. “The meaningful contribution and assistance which your Association has chosen to provide, particularly in the important development areas of health and education, is not only commendable, but serves to make your organization a true inspiration and a nation builder,” Mrs. Simpson Miller said. The Prime Minister lauded the organization for conducting its 14th Annual Medical and Education Mission to Jamaica, which provided educational assistance to students, organized computer training seminars, hosted an education summit and medical clinics, which benefitted over 2,000 patients. 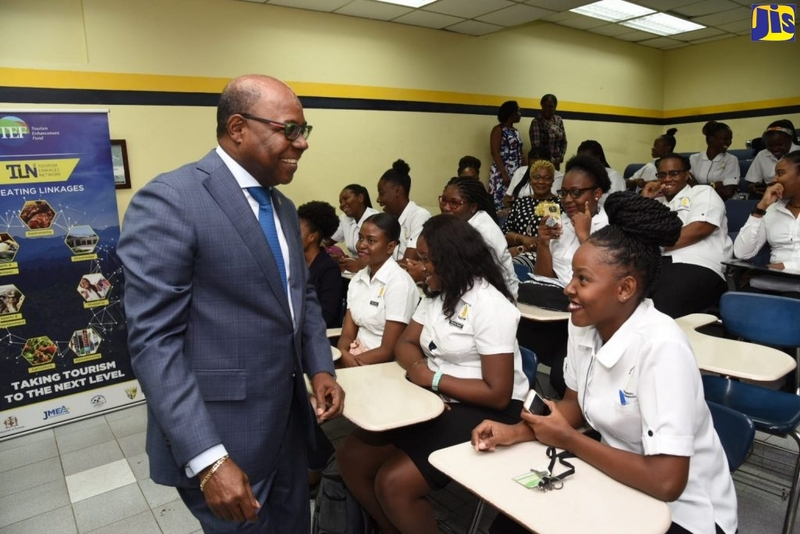 “This kind of assistance is most commendable and I express appreciation for your effort and contribution on behalf of all Jamaicans,” the Prime Minister said. In her remarks, JAAC’s President, Miss Yasmin Facey, said that over the past 27 years, the organization has contributed to over 70 schools across the island. “Our goal is to increase educational opportunities for talented at-risk young people who might not continue their education or have access to current technology,” she said. Miss Facey pointed out that the organization has awarded academic scholarships, build and maintained computer labs and has donated computers, printers and supplies to various schools. Karen Small was the recipient of the JAAC 2013 Recognition Award. Just over 700 Jamaicans and friends of Jamaica attended the banquet. Among them were Jamaica’s Honorary Consul to Los Angeles, Lorna Johnson; President of the Jamaica Teachers’ Association, Dr. Mark Nicely; the JTA’s Secretary General, Adolph Cameron and Diaspora Advisory Board Member to the Mid-west, Mr. Leo Gillins.